Performers on-stage at Los Angeles’s Aratani Theatre during a recent industry demo of the RoomMatch® progressive directivity array loudspeaker system from Bose Professional®. 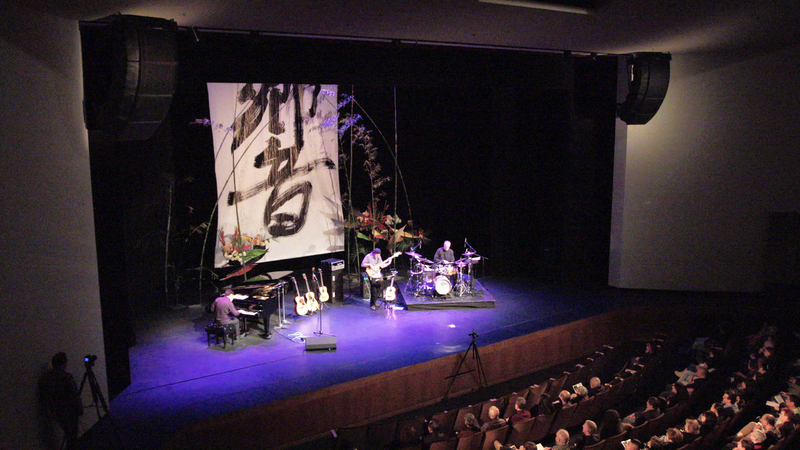 Bose® Holds RoomMatch® Demo at Aratani Theatre in L.A.
Framingham, Massachusetts, May 19, 2015 – Bose Professional® recently held an industry demo of its acclaimed RoomMatch® progressive directivity array loudspeaker system at the Aratani Theatre in Los Angeles – part of the Japanese American Cultural & Community Center in L.A.’s Little Tokyo district. The Aratani Theatre is an 880-seat, medium-sized theater with a warm, intimate ambience – serving not only the Japanese-American performing arts community, but also the broader arts communities of the region. This system is the first RoomMatch installation in the southern California area, and system integration, design and sound reinforcement was performed by ATK Audiotek. The demo was attended by integrators and audio engineers from the area, as well as members of the professional audio media. Each side of the stage features a RoomMatch array including an RM9010 module, an RM9020 module and two RM12020 modules, along with two RMS218 subwoofers located above the center of the stage. The system is powered by four Bose PowerMatch® PM8500N networked amplifiers with processing handled by a ControlSpace® ESP-880 DSP processor. Side-fill stage monitors include two Bose LT 9403 loudspeakers along with RMS215 subwoofers, powered by two PM8500N’s. MacDonald added, “With RoomMatch, Bose has introduced a genuinely new solution, and ATK Audiotek has become a dedicated RoomMatch partner with system design and after-sales support. This represents a truly new opportunity for Bose in the professional audio arena. Commitment from vendors is the key to success in the installation industry, and Bose has illustrated their strong commitment with RoomMatch.” For more information, visit http://pro.bose.com/. Photo Caption: Performers on-stage at Los Angeles’s Aratani Theatre during a recent industry demo of the RoomMatch® progressive directivity array loudspeaker system from Bose Professional®.